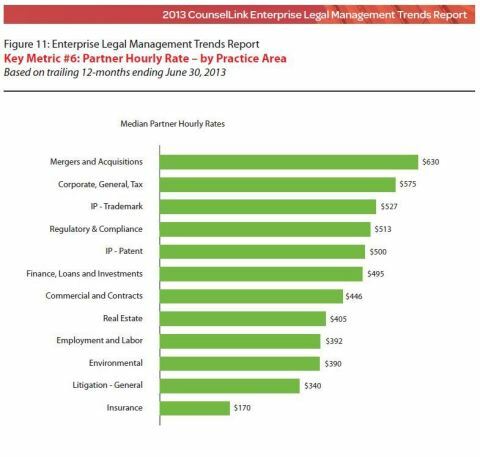 This graphic displays median partner hourly rates by practice area (CounselLink 2013 Enterprise Legal Management Trends Report). This chart shows the % of legal fees billed to CounselLink customers on litigation matters on which the total outside counsel billings were >$1M. Each line shows the % of these billings that firms of that particular size captured in each of the past 4 years. For example, in the last 12 months 41% of all outside counsel spend on these matters went to firms with 201-500 attorneys (CounselLink 2013 Enterprise Legal Management Trends Report). These charts show the frequency with which Alternative Fee Arrangements (AFAs) are used by practice area. 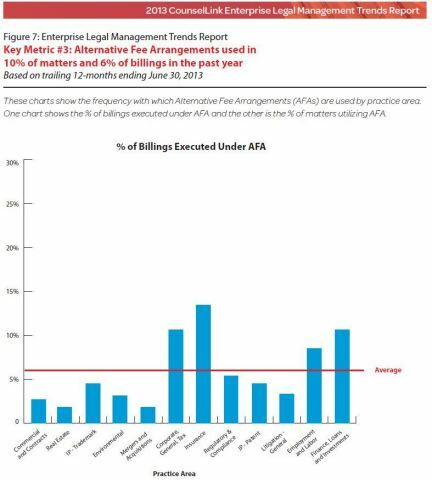 One chart shows the % of billings executed under AFA and the other is the % of matters utilizing AFA (CounselLink 2013 Enterprise Legal Management Trends Report). CARY, N.C.--(BUSINESS WIRE)--The CounselLink business, a leading provider of Enterprise Legal Management (ELM) software, published a report today finding that “Large Enough” law firms – those with between 201 and 500 attorneys – are increasingly winning market share at the expense of the largest U.S. law firms. The underlying drivers for the shift in market share center on corporate law’s consolidation of legal work and that “Large Enough” law firms tend to provide a similar value at a lower cost. In addition, the “Large Enough” law firms are more willing to experiment with AFAs. First, corporate legal departments are increasingly consolidating legal work with firms with between 201 and 500 lawyers – those firms that are “Large Enough” to provide the necessary level of service – and this is happening at the expense of the Largest 50 law firms or those with more than 750 attorneys. Second, these smaller firms are demonstrating comparative capabilities at lower billing rates and a greater willingness to experiment with alternative fee arrangements (AFAs). The report is based on the analysis of two million invoices valued at more than $10 billion in legal fees, for legal work performed on approximately 300,000 matters. These invoices are processed by a wide range of corporate legal departments by submitting them through LexisNexis CounselLink software. 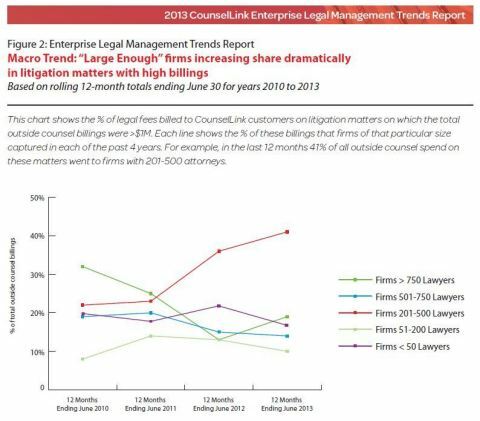 “Large Enough” law firms are eating into market share of the “Largest 50.” Among firms with 201-500 lawyers, referred to as “Large Enough” firms in this report, the share of U.S. legal fees paid by clients has grown from 18% three years ago (July 1, 2009 – June 30, 2010) to 22% in the trailing 12 months that ended June 30, 2013. Simultaneously, the share of U.S. legal fees paid by clients to firms with more than 750 lawyers, the “Largest 50,” has gone in the opposite direction – dropping from 26% to 20% over the same period. Even more dramatic shift in higher fee legal work. The shift in legal work from the “Largest 50” firms (> 750 lawyers) to the “Large Enough” (201-500 lawyers) category is far more dramatic when examining specific categories of matters. “Large Enough” firms have almost doubled the share of high fee litigation matters – those matters generating outside counsel fees totaling $1 million or more (High Fee Work). “Large Enough” firms grew their portion of U.S. High Fee Work from 22% three years ago to 41% in the trailing 12 months. “Large Enough” firms twice as likely to use AFAs. As a percent of their billings, firms with 201-500 lawyers billed nearly twice as much under alternative fee arrangements as did the “Largest 50” firms over the trailing 12 months. Average U.S. law firm partner bills at $381 per hour. In terms of billed hourly rates paid by clients, the average hourly billing rate of a partner in a U.S. law firm increased 2.7% over the previous year to $381 per hour. The partner’s practice area, however, has an impact on the hourly billing rate. For example, advice and counsel for mergers and acquisitions commands a higher-than-average billing rate of $630. The CounselLink business provides ELM software including matter management, legal spend management and legal hold software along with process, analytical and benchmarking consulting services. Billions of dollars in legal fees, billed to corporate legal departments by law firms of all sizes, are processed through the CounselLink solution every year. A detailed report with graphical visualizations of the data is freely available today for download (with registration) on the CounselLink website. CounselLink will be exhibiting at booth #501 at the ACC’s Annual Meeting October 27-30, 2013 in Los Angeles and will have representatives on hand prepared to discuss the reports’ findings. Finally, the CounselLink team will host a live webinar with researchers that will present the reports’ findings on November 13, 2013. The CounselLink business is a leading provider of cloud-based software for Enterprise Legal Management which includes matter management, legal spend management and legal hold solutions designed to help corporate legal departments manage operations while providing analytics and benchmarking tools for better decision making. Expert professional services and product support teams are available to help users maximize the benefits of the branded solution. The CounselLink business offers innovative and tiered proprietary software solutions to addresses the unique requirements of both large and small legal departments. CounselLink is part of the Business of Law Software Solutions (BLSS) group at LexisNexis. Visit us online at www.lexisnexis.com/counsellink. New research indicates law firms with 201-500 attorneys are increasingly winning market share as corporate legal department shift spending away from the largest U.S. law firms.